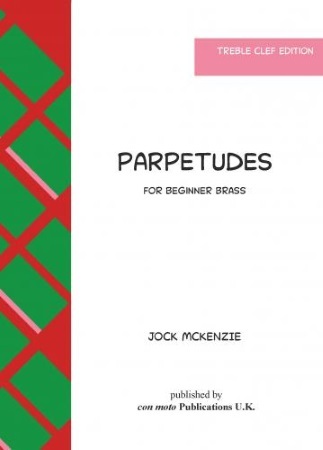 Parpetudes is a comprehensive brass tutor which does not cover such an expanse of ability as the Jock McKenzie Tutor Book for Young Brass Players, but instead provides significantly more material for each new skill introduced. This tutor is for Bb Cornet, Eb Soprano Cornet, Eb Tenor Horn, Bb Baritone, Bb Euphonium, Eb Bass & Bb Bass, all reading treble clef. Parpetudes is a comprehensive brass tutor which does not cover such an expanse of ability as the Jock McKenzie Tutor Book for Young Brass Players, but instead provides significantly more material for each new skill introduced. Parpetudes contains 86 tunes & 10 exercises. 23 of the tunes have a set of downloadable backing tracks (for a small charge), realised by Mark Walker, at two speeds, making it a useful resource for Wider Opportunities Tuition in Schools. The backing tracks are also fun to play along with at home. The remaining tunes have a set of Keyboard Accompaniments, also downloadable for a small charge, by Jock McKenzie. The Backing Tracks & Keyboard Accompaniments are available for Bb, Eb & F pitched instruments. "This is a real teacher-led book that prioritises elements that will be of real use to pupils who join an ensemble quickly rather than just pushing range - rhythm rather than range is the underlying concept. With 40 pages of exercises and tunes, clearly typeset to aid reading, there is a wealth of sideways material (the first 5 notes last until page 14) and the whole book basically covers an octave but includes useful chromatic notes within that range. This is a good book that prioritises music over text and leaves the teaching to the teacher. I'm going to use it!"